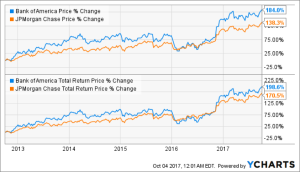 E Better Bank Stock: Bank Of America Or JPMorgan Chase? 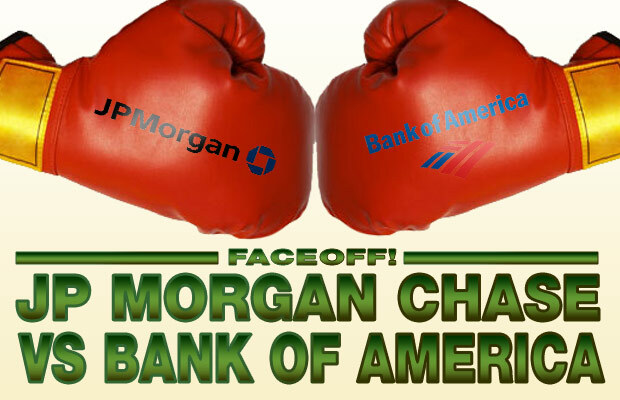 Bank of America (BAC) and JPMorgan Chase (JPM) are among the “big four” banks in the United States. BAC and JPM have $2.25 trillion and $2.56 trillion of total assets respectively. Both have been through the Great Recession and weathered the storm. In this article, we will compare both banks’ past stock performance, financial and operating metrics, balance sheets and dividends, to analyze which bank is the better one. Let us begin by comparing BAC and JPM’s past shares performance. The top chart below shows both banks’ return in the past 5 years and the bottom chart shows the total return including dividends in the past 5 years. As the top chart shows, BAC generated a return of 184% since late 2012 while JPM generated a return of 138.3%. If we included dividends, the difference is narrowed with BAC and JPM generating 198.6% and 170.5% returns respectively. JPM’s dividend yield was higher than BAC's in the past 5 years. BAC has four operating segments: Consumer Banking, Global Wealth and Investment Management, Global Banking, and Global Markets. In its past quarter, the bank delivered a net income of $5.3 billion, a growth of 10% year over year. Its Consumer Banking segment reported $3.9 billion earnings or an increase of 14% year over year. In its Global Wealth and Investment Management segment, the firm delivered $804 million in net income in the past quarter. This was up by 14% year over year. In Global Banking, net income also increased by 19%, to $1.79 billion. 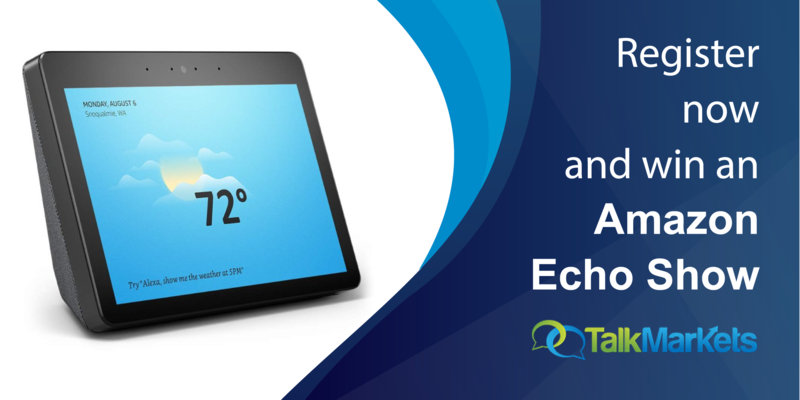 Finally, in Global Markets, its net income was $928 million in the past quarter or a decline of 24% due to lower sales and trading results. Moving forward, the bank is expected to execute its expense-control initiatives. Management wishes to keep its expense to be less than $53 billion per year or about $13 billion per quarter. With increasing revenue and a flat expense, we expect the firm’s earnings to grow at a faster pace than the revenue growth rate. By looking at the proportion of its expense to its revenue, a 10% increase in revenue would result in an earnings growth of 30% assuming expense remains the same. With an improving economy and Fed rate hikes expected, BAC’s net interest margin is expected to continue to improve. Disclosure: This is not financial advice and that all financial investments carry risks. Investors are expected to seek financial advice from professionals before making any investment. Thank you! Nice meeting you! I am a value focused investor. Stocks rise and fall for many different reasons that we often cannot predict. Eventually, it is those companies with a wide moat and the ability to generate cash flow that prevail. Therefore, my investment focus is to find value stocks that are able to generate cash flow, with sustainable dividends and provide growth over time. I focus my attention on analyzing large-capped dividend growth stocks, REITs and ETFs. I aim at providing a quarterly update and insights on stocks I follow. Please feel free to browse the articles that I wrote and provide any comments.